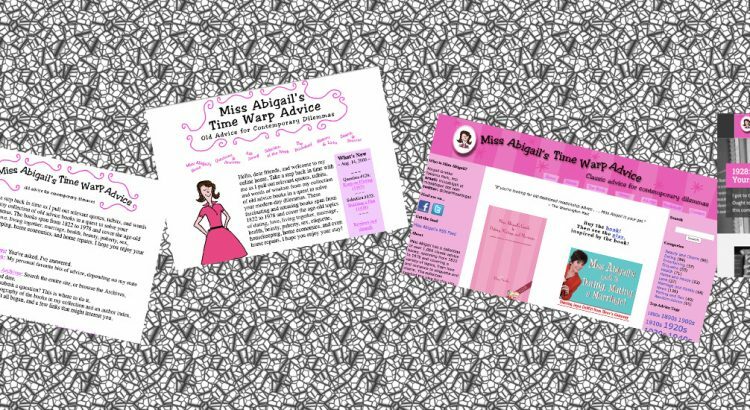 Hello visitors, today I launch a new WordPress theme for MissAbigail.com — I was ready for a fresh look, a more up-to-date theme, and a simplified structure for the site to make it easier to maintain. Please bear with me as I iron out kinks and fix some of the older pages and posts to conform to the new look and feel. It’s just me here and website updating isn’t a thing I do regularly, so I hope you’ll be kind! This update gives me a chance to muse on just how far this site has come. I started way back in 1997 (speaking of wayback, you can see various versions over the years if you so desire), or even back to the very early days. When I began, there was no handy blogging software, so I manually edited HTML twice a week to update this site. I have no idea how I managed that — what happened to THOSE skills? In any case, I am grateful WordPress makes this so easy and that I continue to be supported by the fine folks at MuseArts who host the site and have offered guidance over the years. Thanks, Lise and Chris!